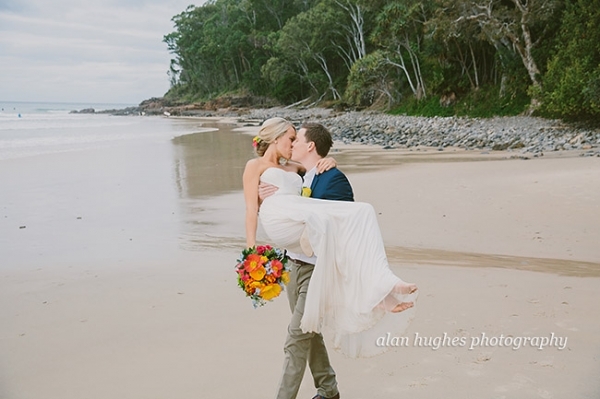 Sarah & Chris had an intimate wedding down on the Little Cove Beach in front of close family and friends. With the surfers in the background and the skies threatening it was a beautiful setting and nothing was going to dampen the obvious love that these two had for each other. I was privileged to capture some special moments for them and thank them for letting me be a part of their special day..
Congratulations Sarah & Chris, I wish you much continued health and happiness. Flowers and decorating and catering by the awesome team at First Class Functions, Celebrant was Jay Flood, hair & makeup by Vicki Nellis, music by Carl Wockner and the fab Citroen car was from Chauffeured Elegance.